Botox or Botulinum toxin is created from botulism causing bacteria (clostridium botulinum). In small doses, Botox is often used to cure muscle problems like lazy eye or uncontrollable blinking since it temporarily blocks nerves or weakens certain muscles in the body. Botox fillers are often used for fighting signs of ageing like wrinkles on the face and Botox injections can also be used to control underarm sweating. The effects of a session last for 4 months. Usually, the side effects of Botox are mild but in some cases, they can be dangerous and even, life threatening. ☢ Side Effects of Mild Nature – The mild side effects are bleeding, slight bruising, soreness, tenderness and stiffness of muscles. 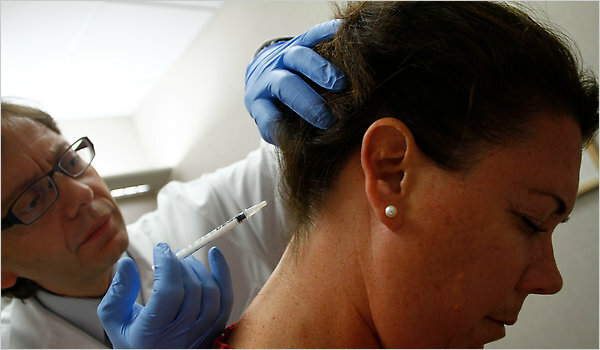 For Botox injected on the forehead, headaches are a common side effect. When Botox is injected near the eye region, itchy eyes, weary eyes, bruising on the eyelid, swelling and light sensitivity is often experienced. Some other side effects of a temporary nature are fever, cough, sore throat, anxiety, dizziness, nausea and fatigue. Usually, side effects such as the ones discussed are usually localized to the area where the injection has been administered and the areas around it. ☢ Allergic Reactions – People not only receive Botox injections for cosmetic reasons but sometimes, it could be because of medical purposes. However, it is common to display an allergic reaction towards Botox. Usually, the allergic responses include swelling, problems in breathing, tightness in the chest and excessive itching. Some people even break out into hives and have a severe allergic reaction to Botox. If any of the symptoms like itching or problems in breathing are experienced by a person, it is important to seek medical help immediately as it could be life threatening if not dealt with as soon as possible. ☢ Life Threatening Dangers – Even though the chances of this happening are slim, there are cases where the Botulinum toxin has spread beyond the site of injection and the side effects of this are deadly. Adverse reactions include vision problems, loss of control over the bladder, muscle weakness of extreme severity, crusting on the eyes and drainage from the eyes, seizures and acute pain in neck or arms. For injections administered in the neck, sometimes people experience problem in swallowing. Immediate emergency medical attention must be sought for any adverse reactions mentioned. It is also important to note that Botox can react with medications or antibiotics that a person is consuming or has consumed. In that case too, some adverse reactions could be witnessed. Any such drugs that are being taken must be revealed beforehand to the doctor administering the injection. As a general rule, pregnant women and women currently breastfeeding must not use Botox. Also, people who are suffering from some kind of infection or have inflammation should not use Botox either. In order to avoid such dangers, only certified aesthetic clinics (see Prive Clinic) should be preferred since the process is tricky and requires a lot of care. Otherwise, the results could be not just uncomfortable but disastrous or even fatal. What you should avoid when selecting hair care treatment? See the Yun Nam Hair Care Effectiveness. When most of us hear the word ‘botox’ we automatically think of injections for facial skin treatments that will help us present a more youthful appearance. Botox does that, but that is not all the product can do. It can help ease the pain for migraine suffers, treat an overactive bladder and overactive sweat glands plus treat several other common health issues. * Those who suffer with chronic migraines (2 weeks or more per month) often find relief with injections of botox. A series of injections are used to block the pain signals which travel along the nerves, lessening the frequency in which the migraines occur and in some instances, stopping them altogether. * An overactive bladder or leaking bladder is often successfully treated with botox. After other course of treatment have been visited without positive results, botox injections can be administered to stop the area nerves from causing muscles spasms which create the bladder issues. * Sweating too much is a disorder suffered by many of the population and those overactive sweat glands can be calmed down with injections of botox. A certain amount of sweating is normal and needed to help the body remain cool, but overactive sweat glands can impair the quality of life and cause sweat to drip off of hands and other body parts when the body is not being exposed to warm temperatures. * Botox treatments are used to treat stiff muscles in arms and legs. Elbows, wrists and fingers which have limited movement due to certain types of trauma or disease like cerebral palsy, oftentimes can be successfully treated with injections and movement restored. Chronic neck pain due to muscles stiffness or repetitive muscles spasms (cervical dystonia) can be treated with injections of this product which until recent years was wrongfully considered as something to be used for facial skin treatments only. * Lazy eye or crossed eyes are often treated with botox. These eye-positioning disorders are usually caused by a muscle-pull imbalance and the tighter eye muscles can be loosened and eye positioning balanced with botox treatments. A droopy eyelid (blepharoptosis) can be corrected with a surgical procedure termed “ptosis repair”. Dr. Kotlus explains this procedure and how it restores eyelid balance. * Botox treatments work by temporarily paralyzing the muscle activity in the affected body region to bring pain relief and restore quality of life.